OK, I know I said this already, but…it took more time than I thought to fix the second block. I finished the block on the right last night. I actually finished the first one the day after I received the fabric from Margaret (about 2 weeks ago! ); however, after carefully placing all that beautiful fabric, I cut the second block too small. The finished size is 14.5″ and I don’t have a template that big. On the block on the right, I ripped out the top and then the left side, then I re-made the left strip wider and with some of my own fabric and also made a new top strip with my own fabric. Margaret is going to cut it to the proper finished size so I don’t make the same mistake again. I hope she likes them. They are going in the mail TOMORROW. I really didn’t think I’d ever want to do this, but Fabric.com made me an offer I couldn’t refuse on the shopping cart full of fabrics I wasn’t going to buy. So I purchased fabric online. Oh boy. I was thinking it would be nice to have a quilt with a mix of reds and aqua accents and most of the fabrics were on sale. I think my selections will go together really nicely. I hope so. I’ll post a picture of all the fabrics when they arrive. I’m hoping they’ll be here by Friday because I really want to get busy with this over the weekend. I also decided to take part in Rachel’s pinwheel sampler quilt-along. I’m going to use the stash from Anna Maria Horner, Jersey Girls, etc. Answer 4 simple questions and find out which “type” you are. The password is character. Thank you for sharing, How About Orange. 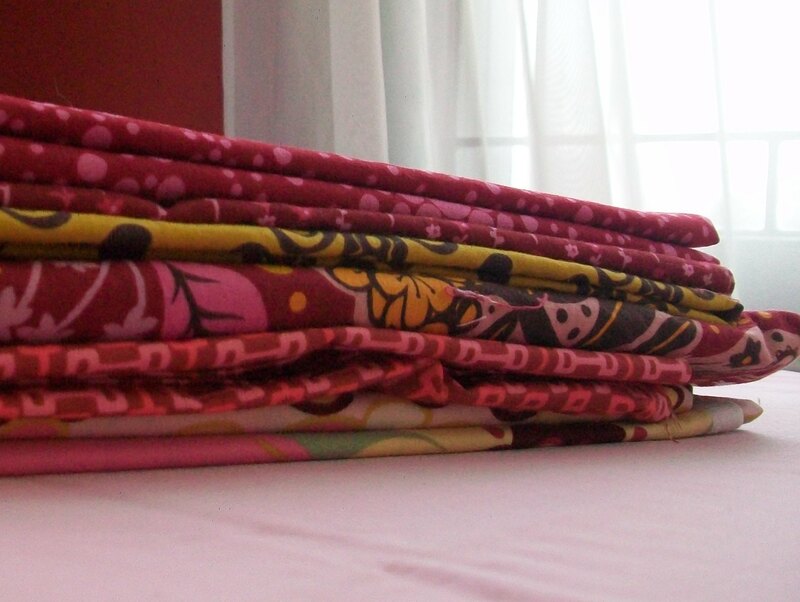 I received the fabrics for my first blocks from Fresh Comfort Two quilting bee. I’m almost done with them. Margaret (a seriously talented quilter) wanted slightly wonky log cabins from the most amazing selection of aqua and brown fabrics (I cannot wait to see what the finished quilt looks like). She provided great instructions and I’m glad I agreed to do two because there was a bit of a learning curve and the second one went together much easier for me. I did end up using a few of my own fabrics because I messed up hers on the final row of the second block (so sorry!). She said we could take from our own stash, so I think they’ll be OK. The problem was that I cut the blocks too short on the last side. They ended up being about 16″ and I had to cut them to 14 1/2″ square. Easier said than done. So I ripped, cut from my stash and sewed again. Now the one block is still too short without cutting at all. Aargh. I will rip and cut and resew this afternoon. Other than that 🙂 I am happy with the results overall. My fabric is added at the top row of the right picture. 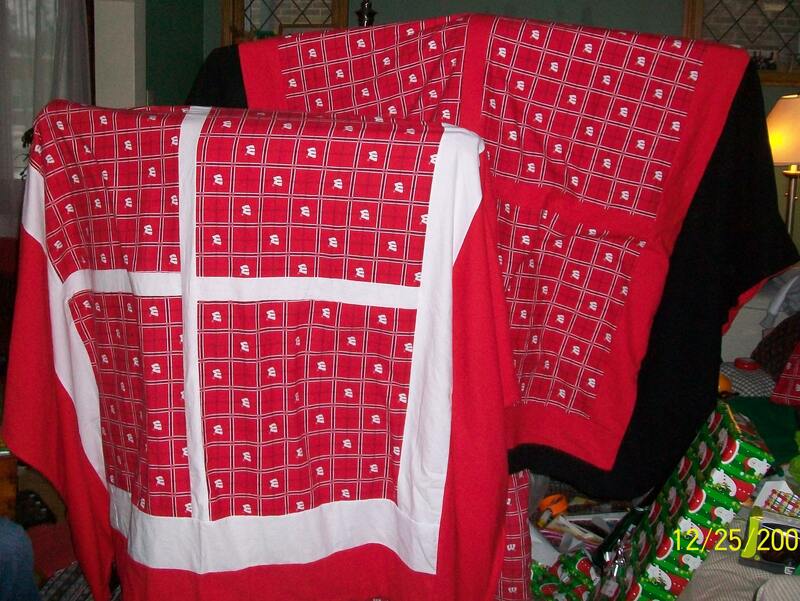 Laura sent me a picture of the blanket she wants me to remake. She must have a lot of confidence in my ability. 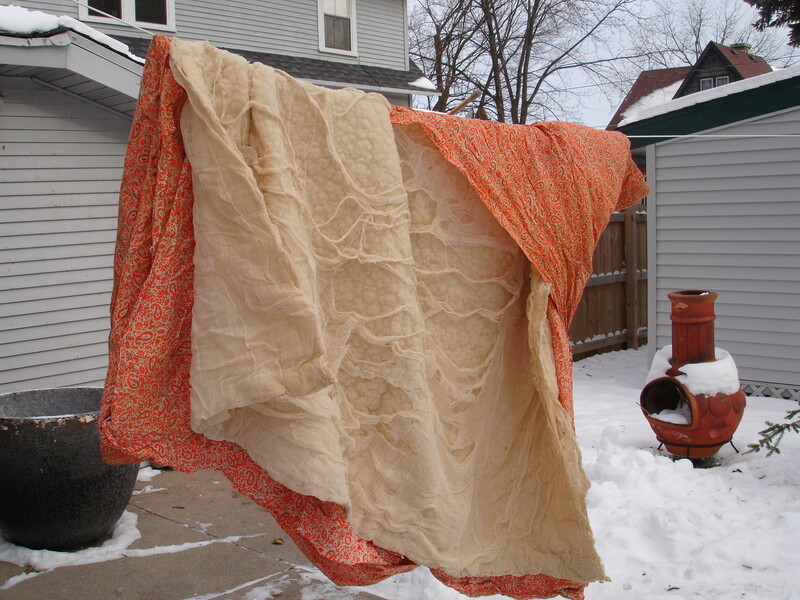 Unfortunately the picture shows more of the batting that she got rid of than the fabric. She said it’s threadbare in places but there’s a lot of usable material. She wants it to be lap blanket size. This has to be at least 40 years old, if not older. The good thing is that she took it apart so long ago she doesn’t remember where she put it (that’s really funny – she’s usually so organized). I think I have until at least spring to come up with something and I’m going to need all that time. What am I going to do with it? I am so open to suggestions. I’m trying to figure out which project to tackle first in this new year. I have a few in mind. My stash isn’t very big, but that’s OK. 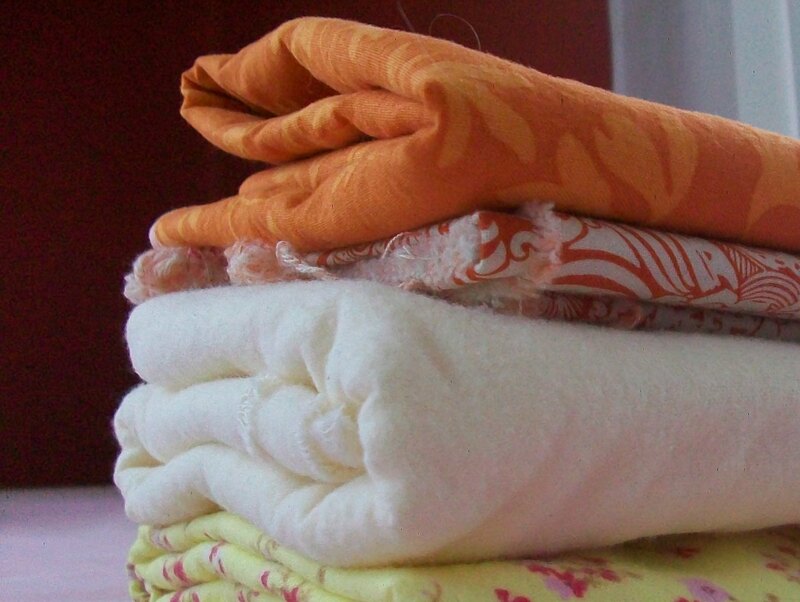 I don’t usually like to buy fabric just to have it – I need a specific purpose. That said, I don’t always have a pattern before I purchase which is probably just as bad. I originally bought this for a new baby across the street, thinking I’d be able to come up with my own pattern. I learned with the boys’ duvet covers that that isn’t always so easy. 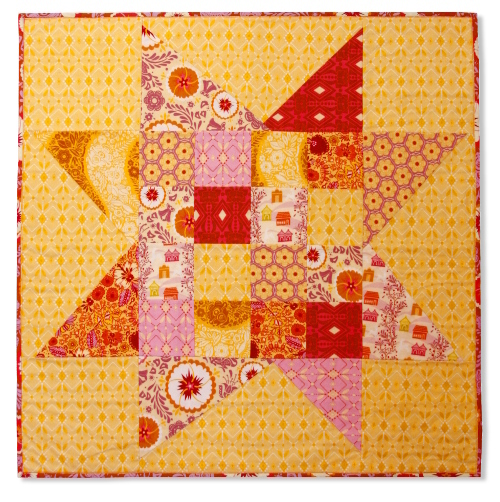 My star might be a bit wonky (if there is such a thing as “a bit” wonky), instead of a patchwork star. But obviously, these colors work together and I absolutely love them. 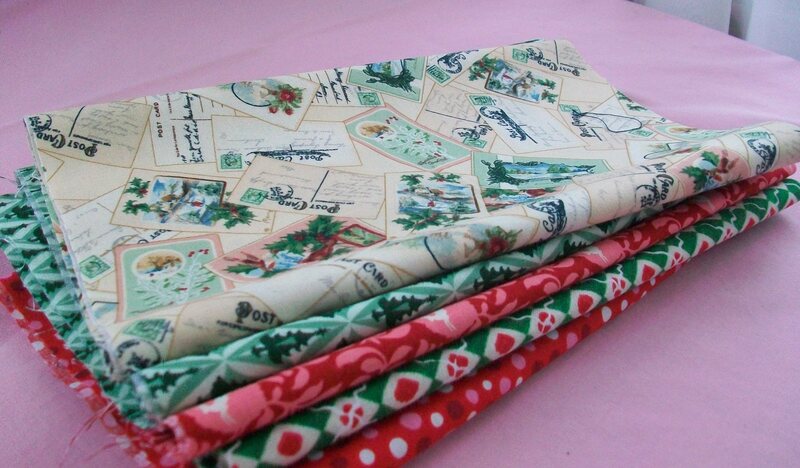 My LQS is having a sale on holiday prints and I got such a great deal on these I’m going back for more. Ignore what I said above about having a need before making a purchase. That doesn’t apply to Christmas fabric, right? 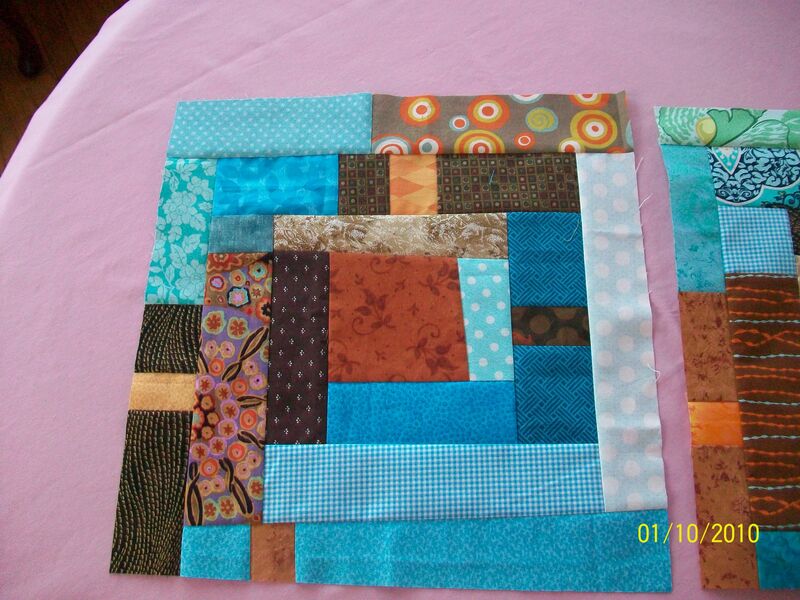 I’m really excited to start working on the first squares for the quilting bee I joined. Our first assignment has been posted. I love the design, and I’m pretty good at piecing, but I’m going to do a practice piece before I work on the fabrics sent by February’s designer, Margaret. I also joined Cancer is Sew Done and am awaiting fabric for the sub-group that I joined. I’m going to practice my free-motion quilting on simple placemats using this fabric. I love the fresh orange look. I thought this was Halloween fabric, but now I think it’s just summery. I guess that’s a lot to work on. Very realistic I think. 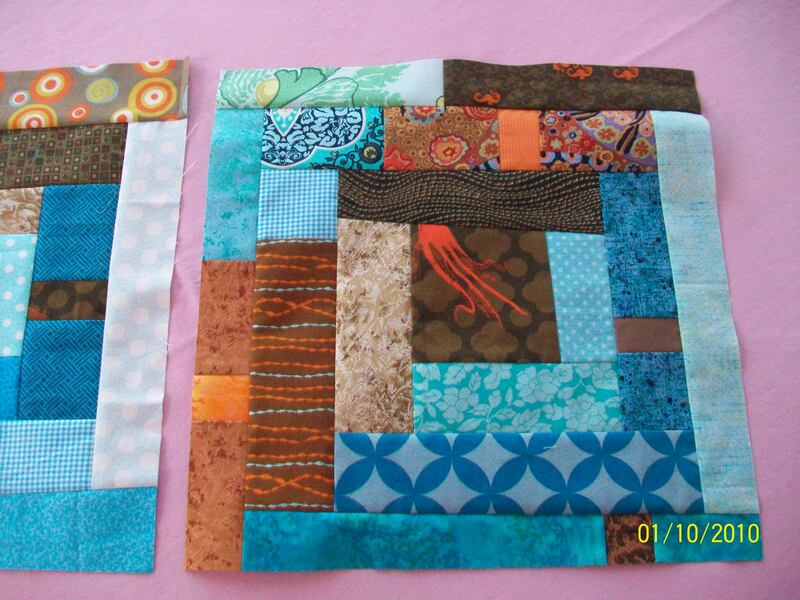 I KNOW I’ll make more than 2 quilts this year, and they have to be quilted somehow, so I’ll get it done. Maybe I’ll take advantage of that 5th class at my LQS and get a little hands-on help. My parents gave me a nice gift card for Christmas, and my birthday is coming up in a few months, so I’m going to look for a more user-friendly sewing machine. My little Singer is OK for sewing, but not necessarily for quilting. It’s tough getting a consistent 1/4 inch seam allowance. I will allow that it’s possible that it just takes more practice, but there really isn’t a 1/4 inch mark on the needle plate, so I have to get better at eyeballing it. Given the precision required for patchwork, that isn’t a great approach. I finished 3 of my 4 projects for the Joy in the New Year Challenge over at Tallgrass Prairie Studio’s blog. That means that I have 7 entries. 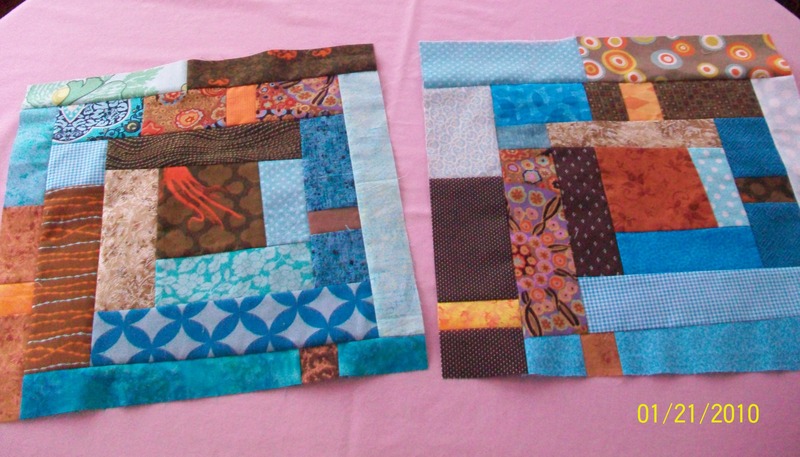 Jacqui is giving away four quilts for this contest, plus other prizes. 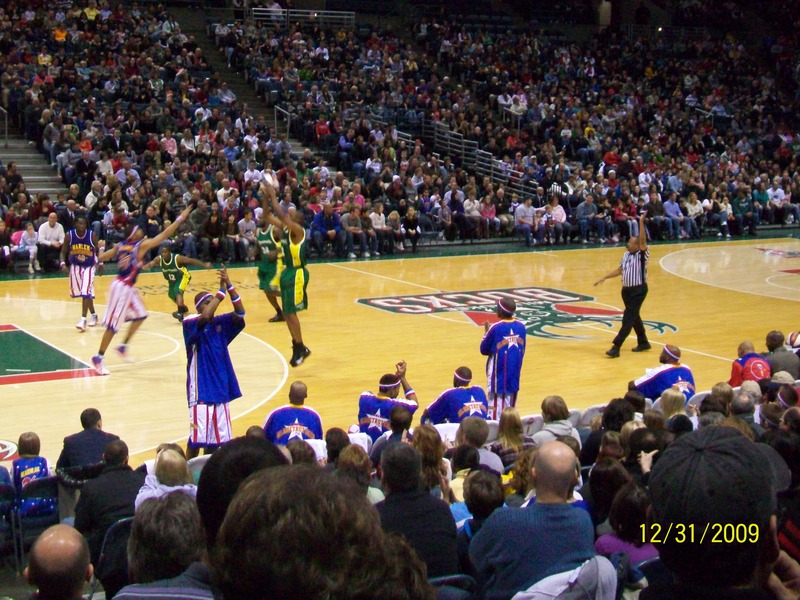 Last night, New Year’s Eve, my family and I did what we always do on 12/31: we went to the Globetrotters’ game at the Bradley Center in Milwaukee. This is a Milwaukee tradition for over 40 years (my older brothers went with my dad when they were little). It’s been our tradition for 9 years now. Last year we also added the afternoon Milwaukee Wave soccer game to the mix and now we’ve done that twice. We go out for an early dinner in between. The Milwaukee Wave is a great team and a really fun way to spend an afternoon or evening with family. We go to every home game we can. They won 12-10 in an exciting overtime finish. 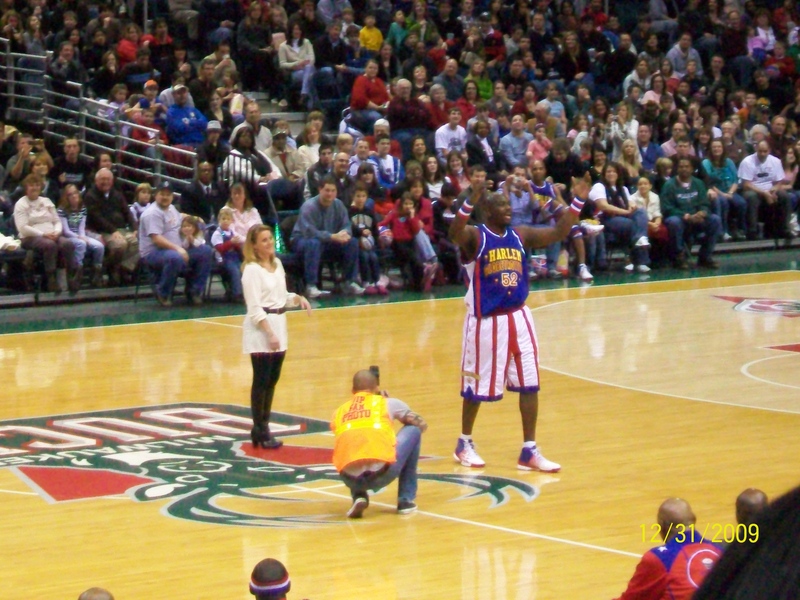 Globetrotter Hijinks - some "play" basketball; others dance on the sidelines. Ladies, if you get courtside seats to the Globetrotters' game, leave your purse at home unless you can dance and want to be "invited" to center court. This lady was a good sport but she did not dance.